The Museum preserves over 10,000 artifacts and photographs in its collections. We provide a stable environment and constant care to fight the ravages of time. However, cowgirls are hard on their equipment! Many objects arrive in the collection in need of cleaning and repair. Other objects naturally deteriorate due to material makeup or treatment prior to donation. Here is how we are preserving the history of the cowgirl. Our Adopt an Artifact program allows the public to make tax-deductible donations that are used solely for object conservation. The cost of treatment provided by a qualified conservator is substantial but necessary to prepare objects for display and preserve them for future generations. Levels of adoption begin at $50 and can be gifted to others. In addition to saving a piece of cowgirl history, there are other benefits for donors. Contact Collections Manager Ashley Kowalski at ahenderson@cowgirl.net for more information. Fern Sawyer began riding at the age of three and participated in her first rodeo at age fifteen. She often competed in men’s events in rodeos because she found the women’s events at the time were too infrequent and uninspiring. In 1945, she claimed first place against a large field of men, becoming the first woman to win the National Cutting Horse Championship title. While beating the boys, Sawyer also became known for her extensive and often glamorous wardrobe. 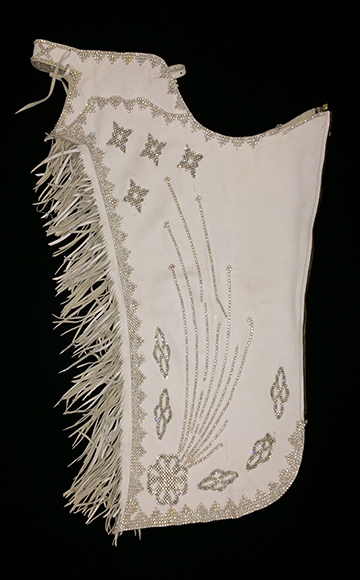 These white leather chaps with silver rhinestones exude her flashy style. Dale Evans Rogers attained mythic status during her career as an actress and singer, eventually being crowned “Queen of the West.” During her career, she starred in 38 motion pictures, two TV series, wrote 25 songs, and over twenty books. She was a role model and true heroine to millions; demonstrating the spirit of the cowgirl in everything she did. 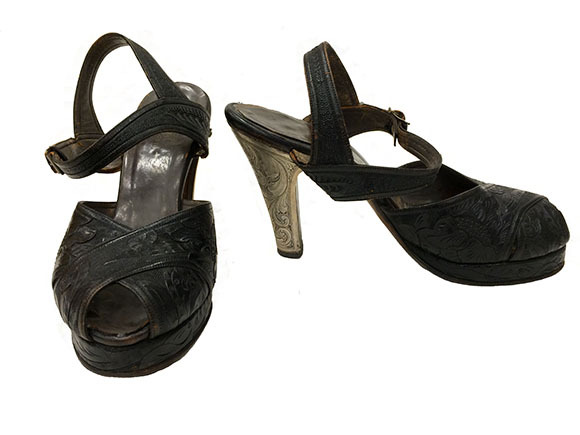 These high heels were custom made for Dale and feature engraved, sterling silver heel caps designed by the famed Edward H. Bohlin. Georgie Sicking, western poet and woman rancher, first began writing her thoughts into poetry as a teenager. From an early age, she was determined to be a cowhand and own a ranch, but faced much opposition to her traditionally masculine pursuits. She worked alongside her husband on several ranches in Arizona and California. Throughout this hard and often lonely life, Sicking continued her poetry and eventually published her book Just Thinkin’ in 1985. Sicking calls these spurs her “mileage meter,” having worn them for sixty years and over thousands of miles working cattle. Born in 1888, Kathryn Binford moved with her family from Illinois to Texas in 1908. She married in 1910 and spent twenty-four years building a large ranch with her husband. When he died in 1934, Binford continued managing and working the ranch as well as raising her two daughters. She spent most of her life on horseback, riding all day, mending fences, and watching the stock. This saddle has her initials on the back of the cantle and has a scabbard for her rifle which she carried to defend against rattlesnakes and coyotes as she rode her traps daily, just as her husband had done. Lulu Bell Parr reigned as the “Champion Lady Bucking Horse Rider of the World.” She thrilled Wild West show audiences with her bronc riding, trick riding, sharp shooting, and buffalo riding. 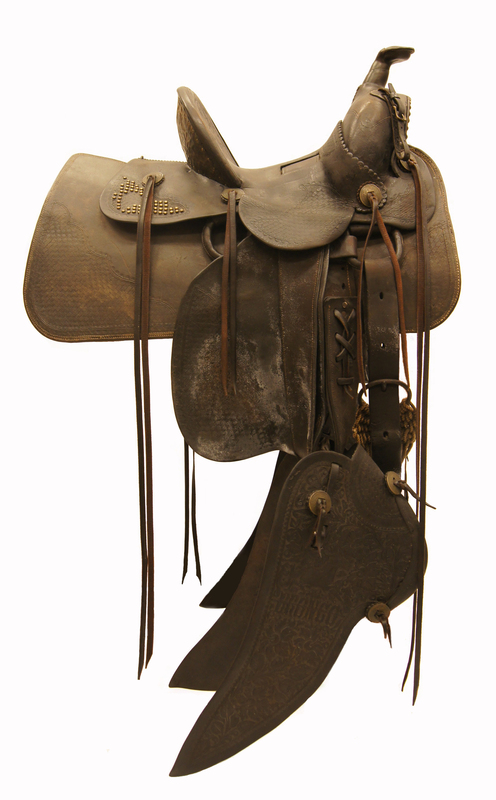 Parr’s saddle was made by the Miles City Saddlery Company of Miles City, Montana. This saddle was conserved in 2015. The surface was cleaned to remove large areas of spew, dirt, staining and then treated with Leather Restoration Conditioner. 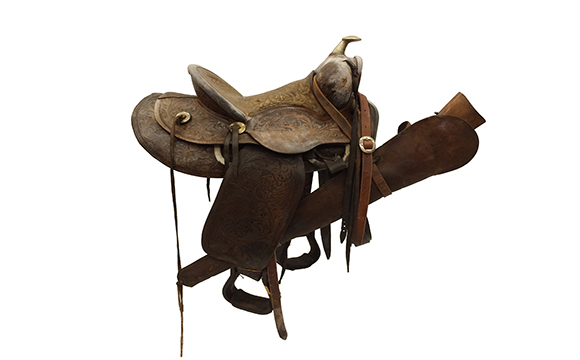 This saddle is now on display in the Museum’s new Hitting the Mark: Cowgirls and Wild West Shows exhibit. Tad Lucas made her professional rodeo debut in 1917 and became a full-time professional cowgirl in 1922. She competed in bronc riding, trick riding, and relay racing and won virtually every major prize offered to women in rodeo during her career. These boots were owned by Lucas. Conservation of the boots included surface cleaning, consolidating the leather, and securing tears. 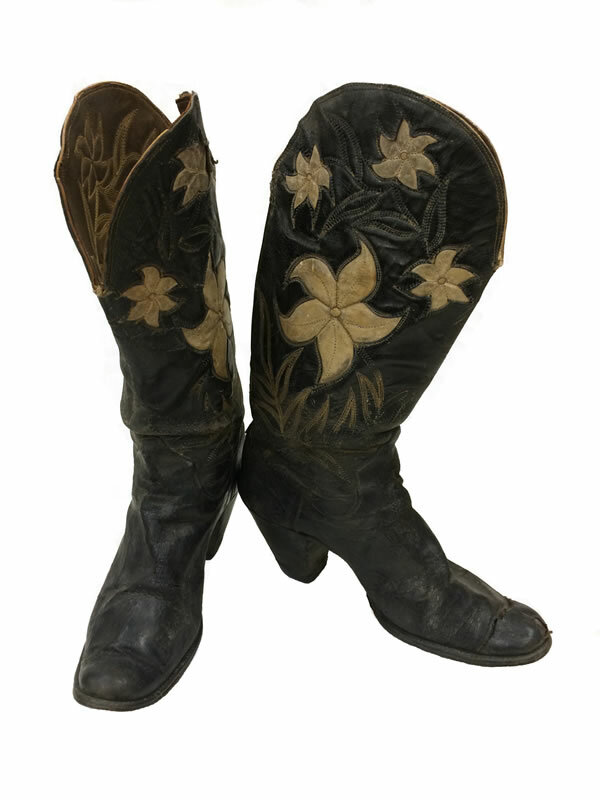 The boots are now on display in the Museum’s new Hitting the Mark: Cowgirls and Wild West Shows exhibit. While shooting, riding, and roping with the men, cowgirls can often be seen as one of the boys. To display their feminine side, cowgirls embellished their gear. This gun holster and belt features brass studs and glass “jewels”. 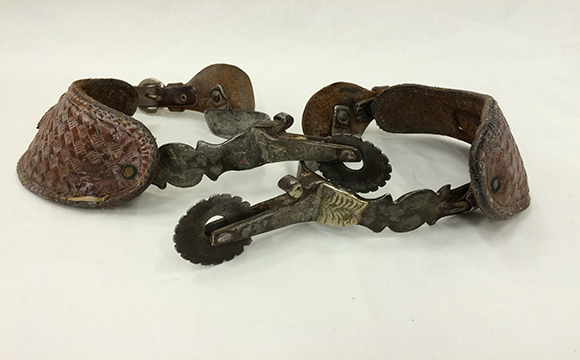 The holster and belt’s conservation included surface cleaning and removal of green accretions and rust. The metal and “jewels” were polished. The holster and belt are now on display in the Museum’s new Hitting the Mark: Cowgirls and Wild West Shows exhibit. The National Cowgirl Museum and Hall of Fame was awarded the Tru Vue Optium Conservation Grant from the Foundation of the American Institute for Conservation in June 2014. 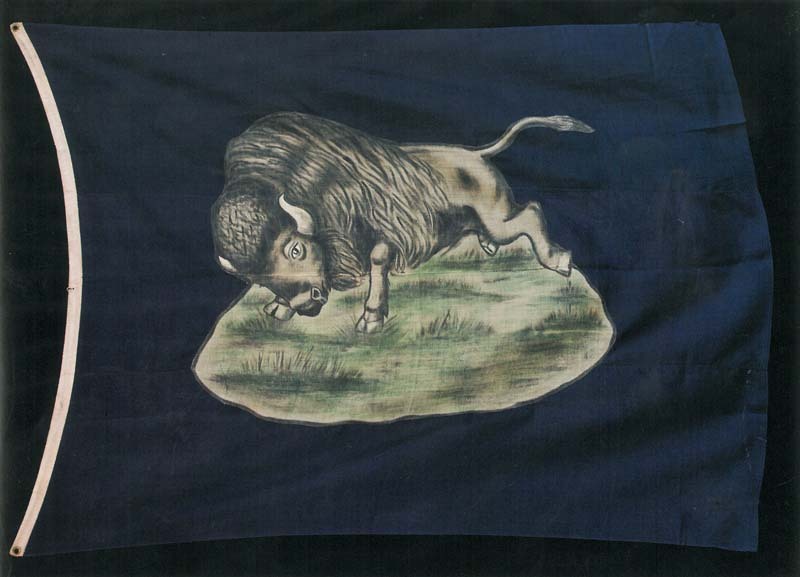 Funding provided by this grant helped conserve and frame a parade flag from Buffalo Bill’s Wild West Show. The rare flag is the centerpiece of the Museum’s newest permanent exhibit “Hitting the Mark: Cowgirls and Wild West Shows” which explores the significant role women performers played in the Wild West shows. The Museum thanks the Foundation of the American Institute for Conservation and Tru Vue, Inc. for their financial support in preserving this important piece of history.